DirektHost provides virtual servers with dedicated processing power and RAM memory so as to provide an effective response to the needs of a booming business that has a high volume of traffic on the site such as an online store, or that runs online complex applications for the every day activities. 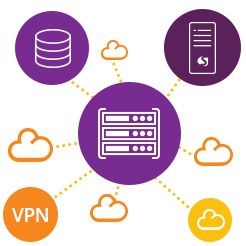 Unlike the basic version of hosting (shared host), the VPS provides resources dedicated to a single client, thus allowing optimal performance for his systems. What is a VPS and how does it work? This can also be called Virtual Dedicated Server. Here, a server is divided into multiple virtual servers where each website is hosted on its own dedicated server, but they share the underlying physical hardware with other VPSs. Users have root access to their own virtual space and also a secured hosting environment. All Virtual Private Servers are hosted on the same, high-end Dual Quad Core Xeon servers (all packages are equal-share CPU). All our VPS hosting nodes run RAID10 for maximum performance and reliability and employs massive amounts of memory. VPSs are not recommended to support a presentation site and a few e-mail boxes as it will represent additional costs that can not be justified by the company’s need for the resources from this alternative hosting. * Flexibility: The chosen package can be changed any time the company’s need for resources increases. * Optimized costs: We offer our customers expert advice in order to choose the best option depending on specific needs. * User Control: The client has access to an intuitive control panel to customize the server management. * Business Sustainability: Our servers network provides the technical basis necessary for a booming viable hosting service business. In addition, support is fast to resolve any problems without delay.